Located just north of the Armed Forces Retirement Home, more commonly known as the Soldiers’ Home, in Washington, D.C., lies the United States Soldiers’ and Airmen’s Home National Cemetery, one of the country’s oldest national cemeteries. The cemetery’s rolling hills mark the final resting place for more than 14,000 veterans, including those that fought in the Civil War. One of the most prominent people buried in the cemetery is Major General John A. Logan, who led the Army of the Tennessee and established the first Decoration Day observances. The cemetery is one of two national cemeteries maintained by the Department of the Army. The cemetery offers a final resting place for residents of the Armed Forces Retirement Home - Washington. During the Civil War, churches and other public buildings around Washington were commandeered for use as military hospitals to care for wounded troops or those stricken with illness on the front lines. Just days after the Battle of Bull Run, the Commissioners of the United States Military Asylum offered six acres of land at the north end of the Home’s grounds as a burial ground for soldiers and officers. This offer was accepted in late July 1861, and the first burials were made shortly thereafter on August 3. From 1861 to 1864, the cemetery accepted thousands of soldiers' remains from 17 of the 25 Union states, quickly filling the six-acre cemetery’s capacity. An 1874 report on the condition of the cemetery noted more than 5,600 interments, including 278 unknown, 125 Confederate prisoners of war, and 117 civilian relatives of the deceased and employees of the Home. In 1883, more than nine additional acres were added to the grounds, bringing the cemetery’s total size to nearly sixteen acres. In 1900, all of the Confederate remains were reinterred in Section 16 of Arlington National Cemetery. At the west corner of the cemetery stands the imposing main gate, which consists of four pairs of Doric order columns, each inscribed with the name of a well-known American General, including George Washington, Winfield Scott, and Ulysses S. Grant. A simple wrought-iron fence surrounds the cemetery on all sides, except along the north edge of the site, where the fence sits atop a stone retaining wall. A second, vehicular gate on Harewood Road, NW features a double iron gate with stone piers. 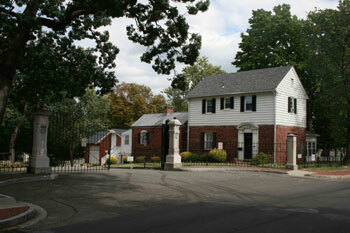 Just inside this gate is the two-story superintendent’s lodge, built circa 1867, and the Logan Mausoleum, the most prominent burial monument at the cemetery. 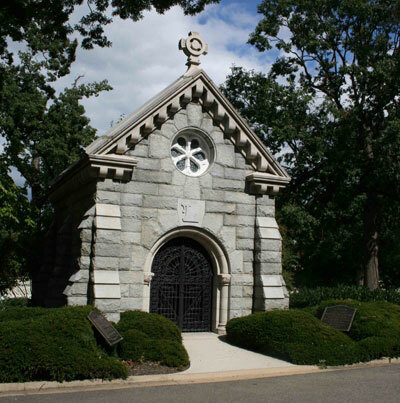 Alfred Mullett, once the supervising architect of the Treasury Department, designed the granite, Norman-style mausoleum, which houses the remains of General John A. Logan; his wife, Mary S. Logan; daughter, Mary Logan Tucker; and grandsons, Captain Logan Tucker and George E. Tucker. General Logan served during the Mexican-American War, and was later a member of Congress from his home state of Illinois. At the outset of the Civil War, Logan organized a volunteer regiment, rising to the rank of Major General. He returned to Congress after the war and in 1884 appeared on the Republican presidential ticket, losing a close election to Grover Cleveland. Logan also served an important role in the Grand Army of the Republic (GAR), issuing General Order No. 11 on May 5, 1868, which called for the GAR to spread flowers on the graves of Union soldiers. On May 30 of the following year, the first Decoration Day took place, ultimately leading to the founding of Memorial Day. United States Soldiers’ and Airmen’s Home National Cemetery, one of the two national cemeteries maintained by the Department of the Army, is located at 21 Harewood Rd. NW, in Washington, D.C. The cemetery is open every day of the year from 8:00am to 5:00pm (Memorial Day until 7:00pm). The office is open, subject to the Superintendent's schedule, Monday-Friday from 8:00am to 4:00pm, except Federal holidays. The office telephone number is 877-907-8585. For more information, visit the United States Soldiers' and Airmen's Home National Cemetery website. While visiting, please be mindful that our national cemeteries are hallowed ground. Be respectful to all of our nation’s fallen soldiers and their families. Additional cemetery policies may be posted on site. Visitors to Soldiers’ Home National Cemetery may also be interested in President Lincoln’s Cottage at the Soldiers’ Home, on the grounds of the Armed Forces Retirement Home. The cottage is also the subject of an online lesson plan, President Lincoln’s Cottage: A Retreat. The lesson plan has been produced by the National Park Service's Teaching with Historic Places program, which offers a series of online classroom-ready lesson plans on registered historic places. To learn more, visit the Teaching with Historic Places homepage.